Item #:82136 - UltraCard Premium is the preferred card for High Definition Printing (HDP) applications. The affordable and extremely durable UltraCard Premium is the non-technology card of choice for the Fargo HDP5000 and other Direct-to-Card (DTC) applications that require a higher quality card. Item#0602-4960 - ADHESIVE OVERLAY - 2 Mil. Clear Overlay that sticks directly onto your ID cards and badges offering added protection and durability from wear and tear. Save the cost of a laminating ID card printer by manually applying these overlays to give your cards extra durability. Sub-Credit Card Size allows easy placement on standard CR80 Size cards. - 500/Pkg. 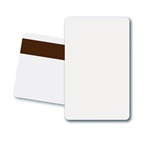 Heavy-Duty 7 Mil UV Blocking Self-Adhesive Clear Protective Credit Card Overlay - 500/Pkg. Item#0602-4950 - ADHESIVE OVERLAY - 7 Mil. Clear Overlay that sticks directly onto your ID cards and badges offering UV Protection and added durability from wear and tear. Save the cost of a laminating ID card printer by manually applying these overlays to give your cards extra durability. For use on standard CR80 Size cards. - 500/Pkg. Heavy-Duty 7 mil. Self-Adhesive Overlay With Repeating 2-D "Key and Seal" Hologram - 500/Pkg. Item#0602-4900 - ADHESIVE OVERLAY - 7 Mil. Heavy-Duty Security Overlay with 2-D "Key & Seal" Repeat Random Hologram Design that sticks directly onto your ID cards and badges offering added protection and durability from wear and tear. Save the cost of a laminating ID card printer by manually applying these overlays to give your cards extra durability. For use on standard CR80 Size cards. - 500/Pkg.